I use sandpaper to sharpen my chisels. By "sanding" the bevel of the blade flat and smooth, it produces a sharp edge in just a few minutes. The problem is holding the chisel at a consistent angle as you sharpen. 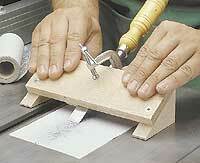 To do this, I clamp the chisel to a simple sharpening guide (see photo). As you can see in the drawing at the right, the guide starts off as a pair of wedge-shaped support blocks that hold the top at a 25° angle. To square up the chisel (and keep it from shifting), it sits against a wood cleat that's glued into a dado cut in the top. To set up the guide, place the chisel against the cleat and slide it down until the bevel is resting on a flat surface (not on the sandpaper). Then clamp the chisel in place and "scrub" it back and forth across the sandpaper. Note: I start with 180-grit sandpaper and work up through 400 grit.